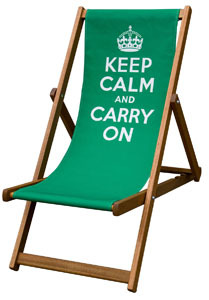 Keep Calm and Carry On Deckchair. 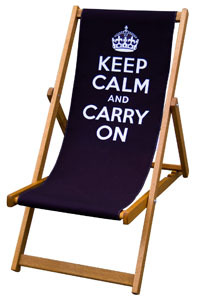 Fantastic Designer Deckchair with Keep Calm and Carry On in Union Jack Deckchair printed on the sling. It makes an excellent personalised printed photo gift as a Birthday Present or Wedding Present. 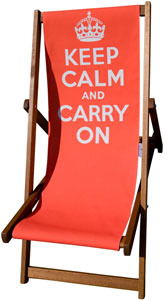 Our deckchairs are very hard wearing and durable - the frames are made with merpauh wood, treated with teak oil which provides excellent protection against the elements, extends the working life, and enhances the natural appearance. 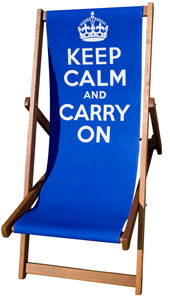 The deckchair slings are made from very hard wearing polyester sail cloth, and printed using state-of-the-art technology. 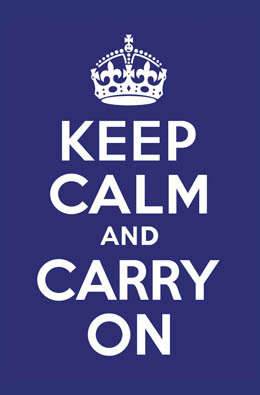 All our products are produced on demand & can be personalised with your own images and artworks. See our website www.eyeswidedigital.com for more information. To purchase this product either click the buy button at the bottom of the page, which will take you through to the Paypal payment process or , if you prefer, print out this page and fax to 01737 780987 or email info@eyeswidedigital.com or telephone 01737 780789.